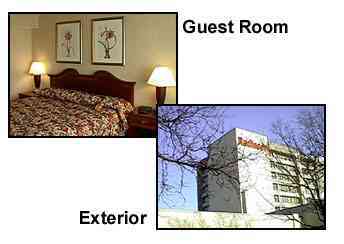 The Radisson O'Hare is a first class hotel located five minutes from the Chicago O'Hare International Airport. Its newly renovated guest rooms feature contemporary decor and include a work space with a desk, a coffee/ tea maker with complimentary coffee and tea, a remote control color TV with cable, Pay Per View movies, and Nintendo, a direct dial telephone with modem and data port connections, an iron and ironing board, electronic door locks, an alarm clock radio, a hair dryer, and refrigerators are available upon request. The hotel offers a complimentary airport shuttle, an indoor and an outdoor heated swimming pool, a sauna, a fitness center, an on site restaurant, room service, a lounge, meeting facilities, a business center, an ATM in the lobby, and Maxi's Sports Bar which features a big screen TV, a pool table, and video games. Valet and dry cleaning services are available as well. The hotel is 15 miles from downtown Chicago and is accessible to the CTA Blue Line to downtown. Radisson O'Hare is also just minutes from Chicago's fine dining, shopping, and entertainment.